The following chart shows the HTML named color names in alphabetical border. Quantum computers will process information ultra faster than silicon-based computers. In the near future microprocessors would be of atomic scale of quantum computers. They will use the power of atoms and molecules to perform memory and processing tasks. The basic quantum computers built by scientists perform certain calculations and promise a new era of computing. In 1930 Alan Turing introduced a theoretical device for modern computers. Alan Turing Machine consists of tape of unlimited length and divided into small squares. Each square will 1 or 0 or be left blank. A read-write device reads these symbols and blanks, and gives the machine its instructions to perform a certain program. In a quantum Turing machine, the difference is that the tape exists in a quantum state. The normal Turing machine can only perform one calculation at a time but a quantum Turing machine can perform many calculations at once. Quantum computers are not limited to two states as it uses atoms, ions, photons or electrons to act as computer memory and a processor. A 30-qubit quantum computer could run at 10 teraflops (trillions of floating-point operations per second). Marcus Chown, writes to New Scientist as Quantum bubbles are the key to quantum computing. As he says, It seems that bubbles of electrons lined up in ultracold liquid helium could be used to build a quantum computer capable of carrying out a staggering 1030 simultaneous calculations. Weijun Yao of Brown University in Providence, Rhode Island, wants to replace atoms with curious things called electron bubbles. 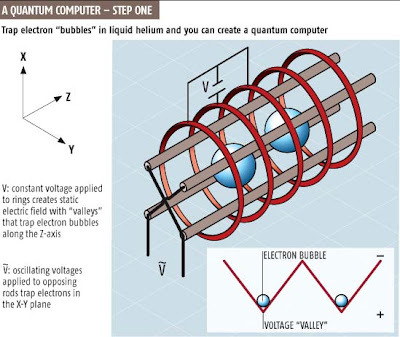 To make an electron bubble, he suggest to start with liquid helium that has been cooled below 2.17 kelvin so that it behaves like a superfluid, a state of matter with zero viscosity. Now inject a fast-moving electron into the superfluid. When the electron eventually slows to a halt after numerous collisions with helium atoms, it creates a cavity about 3.8 nanometres across by repelling nearly 700 atoms' worth of helium around it. 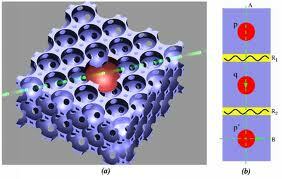 It is this cavity that makes the electron bubble so very valuable. In a quantum computer, the quantum entities need to be isolated from their surroundings to preserve their fragile states. "What could be more isolated than an electron in a bubble?" asks Yao. "The electron inside each bubble interacts very weakly with the background helium atoms." Yao says that an electron's spin can exist in both states at the same time, enabling the qubit to be both 0 and 1. Because each qubit carries two values, a quantum computer with two qubits could carry out four parallel calculations, one with three qubits eight calculations, and so on. "I see no major technical obstacles to the system I envisage working with 100 qubits," says Yao. "That means it could do 1000 billion billion billion operations all at once." writes Marcus Chown. How would the future of computing change? පහත දැක්වෙන සිංහල තොරතුරු තාක්‍ෂණ හා සන්නිවේදන පාරිභාෂක වදන් මාලාව රාජ්‍ය භාෂා දෙපාර්ථමේන්තුවෙන් නිකුත් කරන ලද්දකි. මෙම වදන් මාලාවට අමතරව ICTA, කොළඹ හා මොරටුව විශ්ව විද්‍යාලද, පෞද්ගලික අංශයෙන්ද, අධ්‍යාපන අමාත්‍යංශයෙන්ද, ජාතික අධ්‍යාපන ආයතනයෙන්ද නිකුත් කරන ලද වදන් මාලා ලේඛනද පවතී. එක් එන වදන් මාලා බොහෝ දුරට සමාන වන අතර සමහර වදන් තරමක් වෙනස් ලෙස යොදාගනී. උසස් පෙළ තොරතුරු තාක්‍ෂණ හා සන්නිවේදන විභාග වදදලදී යොදා ගැනෙන වදන් 1000 ක් පමණ ඇති අතර, ඒවාද Bit, Bit Speed, Bit Pattern ආදී ලෙස සමහර වදන් නැවත නැවත භාවිතා වන නිසාත්, වරහන් තුල ඉංග්‍රීසි වචනය දෘඩකය (Hard Disk) ලෙස ලබාදෙන නිසාත් මතක තබාගත යුතු වචන ගණන සීමා සහිතය.